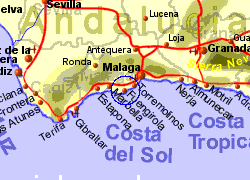 Lying just over half-way between Malaga and Marbella on the Costa del Sol, Fuengirola has a wide promenade with gardens and palm trees behind the sweeping beach 7Km long of white sand. 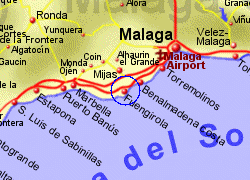 There are plenty of restaurants and some high rise hotels and apartment blocks here in a resort that is popular with Spanish together with other nationalities. Hence you will find a mixture of traditional Spanish tapas bars, restaurants and English bars. The resort has something for everyone but appears most attractive to families and older couples. Fuengirola has a good selection of shops and there is a traditional street market on Tuesdays. 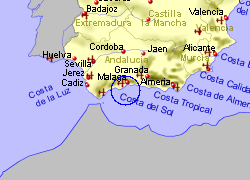 Map of the Fuengirola area.